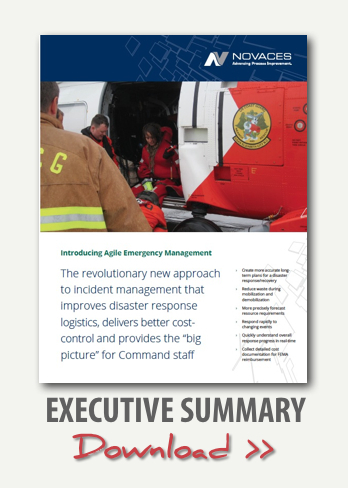 AGILE EMERGENCY MANAGEMENT IMPROVES DISASTER RESPONSE LOGISTICS, REDUCES FRONTLINE STRESS, AND DELIVERS BETTER COST CONTROL. When disasters occur and create emergencies, the ability to respond to the uncontrolled event with maximum speed and coordination of resources can save billions of dollars in damages and prevent unnecessary loss of life. Agile Emergency Management was developed as a result of direct experience with large-scale disasters that required long-term cleanup and remediation in the Gulf Coast region. Consider a forest fire, for example. An out-of-control campfire becomes a raging fire subject to geography and changing weather conditions. Responders do not deal with where the fire has been, but rather must predict where it will go next and work to contain it. In the case of the Deepwater Horizon oil spill in the Gulf of Mexico, shifts in tides and winds meant that that same shoreline cleaned last week might be contaminated once again. For this reason, work completed did not necessarily represent earned value. TO BE AGILE, WE CONVERTED STATIC INCIDENT COMMAND SYSTEM CHECKLISTS TO A DYNAMIC PLAN BY ADOPTING PROJECT MANAGEMENT PRINCIPLES. The Incident Command System (ICS) mandated by Congress has proven to provide the structure for an effective, functional, and rapid response to an emergency. However, it does not apply available best practices from project management for supply chain management, resource leveling, or scope management. When project management principles are applied to an emergency response, it brings order to the chaos and provides responders with clear direction and focus. EXPERIENCED CONSTRUCTION PLANNERS AND PROJECT MANAGEMENT SOFTWARE COMBINE TO BRING ORDER TO THE CHAOS AND PROVIDE A "BIG PICTURE" PERSPECTIVE TO THE COMMAND CENTER. 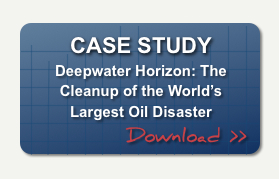 During the response to the Deepwater Horizon oil spill, our project managers provided coordination and planning for 37 entities to bring order to an unprecedented effort to restore the Gulf Coast beaches and the fragile ecosystem of the Louisiana wetlands. 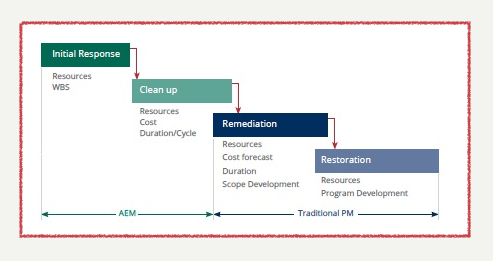 The Agile Emergency Management approach developed for the most costly environmental disaster in U.S. history demonstrated how the ability to capture ever-changing scope and constraints provided results that exceeded the typical outcomes of an ICS response without “agile” processes built in. WHAT HAS BEEN RECENTLY DISCOVERED ABOUT AGILE EMERGENCY MANAGEMENT CANNOT BE LOST DUE TO SATISFACTION WITH THE STATUS QUO. These processes must be adapted into corporate emergency response plans and, ultimately, formally adopted into the ICS protocols. To learn more about incorporating Agile Emergency Management into your emergency response plans, contact us to schedule a 40-minute best practice briefing on how to enhance your ICS compliant program.